There is much research over the environmental and scientific value of trees. Plants of all kinds are an indubitably essential part of our ecosystem – removing harmful carbon dioxide from the air and replacing it with breathable oxygen, providing food, and even filtering water for use by other animals. While you may not be thinking about cutting down the vegetation in your backyard for food or drinking water, planting trees around your home and in your neighborhood can have a number of beneficial effects that weren’t discussed in eighth-grade science glass. Trees provide natural scenery, and may have a calming effect that can be beneficial in medicine. Some research shows that patients in hospitals heal faster when surrounded by trees and plants – and other studies have found that visual exposure to trees produces a calming effect and reduces stress within five minutes. Imagine how much more welcoming and bright a house feels with houseplants and flowers – it’s not far-fetched to imagine that cheering effect on a larger scale! Trees are useful in architecture to provide contrast and break up scenery. They can also be used to form a windwall, saving up to twenty percent on energy costs during cold weather. A wall of trees can even block out noise, making a crowded or busy neighborhood suitable as a residence for anyone. Trees provide natural shade, also saving on energy costs and the costs of installing patio awnings or roofs. And trees, of course, improve our landscapes and the value of our aesthetic surroundings like no other landscaping tool or technique. Home tree care can be a task that’s beyond daunting – for the average Washington state resident, proper tree care is impossible without the help of a Kirkland tree service or Bellevue tree service. Also a Redmond tree service, Certified Arborist Tree Care is headed and overseen by a certified arborist with advanced training in pruning, bracing, transplanting, and all other tree services. For smart, affordable tree care – and all the physical and mental benefits of trees – consider planting in your yard with the help of a professional. General Distribution: Extreme southeastern Alaska through western British Columbia; Cascade region of Washington and Oregon; northwestern California; Olympic Mountains of Washington. Wood Value: Soft, weak, light in weight and color and has little odor or resin. The most common uses are for light construction frames, subfloor, construction plywood, sheaths, container veneer and pulpwood. As a “white” wood, it’s a major export to Japan for business construction. It’s also used for Christmas trees and decorative greenery. Other uses and values: Is grown as an ornamental and is a major component of recreational and wilderness areas. A monoecious, long-lived, native conifer. Can reach heights of 100 to 230 feet and diameters of 36 to 44 inches. The average maximum age is 400 to 500 years on good sites and 250 to 350 years on adverse sites. The maximum recorded age is 540 years. The crown is rigid and symmetrical with lateral branches perpendicular to the stem. Young trees have resin-filled blisters protruding from the smooth, thin bark. The bark of older trees is rough textured and flaky. The needles grow from opposite sides of the branch, spreading horizontally or brushed forward. The top is flat, grooved and lustrous green and the underside is stomatiferous and silvery white. Has a second type of foliage on the uppermost, cone-bearing branches. These needles are sharp and curved. The cones are stiffly erect, barrel shaped and 3.5 to 6 inches long. 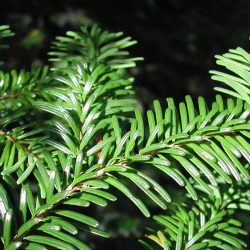 At lower elevations in the Pacific silver fir zone, it usually sun scalds when used as leave tree in shelterwood cuttings. Sudden exposure to sunlight temporarily reduces growth. Herbicides have various effects (check with the product manufacturer). Wounds result in wetwood, circular or radial shake, and frost cracks. Is among those species that are most seriously affected by annosus root disease. After being weakened by annosus root disease, infestation by fir-engraver beetle, silver fir beetle, or fir root bark beetle is frequent. One of the most devastating pests to impact it is the balsam woolly aphid. Infested trees appear swollen, with gouty twigs, poor crowns and little growth; death occurs within two to three years. Infested trees have mottled-red foliage, distinct crown lean and appear to die from the top down. Is very shade tolerant and has low spatial requirements. It can survive in the shade and emerge in stands that are uneven-aged. The post Tree Spotlight: Abies amabilis appeared first on Tree Services. Trees are always a beautiful addition to your landscape. Tree removal services are often necessary and important for visual and to prevent hazards. To encourage the growth of your trees, strong and healthy tree trimming is required. Proper pruning improves the health of your trees by removing dead or dying branches which in the other way protects your house and also enhances the beauty of your property. It also protects the branch structure and reduces hazards such as falling limbs or low-hanging branches, thus protecting the windows, window panes and roofs of your house. For on fruit trees, it improves the size and quantity of the fruit. A good tree removal service provider is the best way to keep your house protected from any hazard from felling trees. Tree removal is strenuous and dangerous and it has to be done very cautiously. Tree trimming experts know how to take care of your trees and they use traditional and organic elements to make your yard stunning, without harming the environment. A tree has been felled and its wood removed, but the rest still remains there, firmly rooted in the ground so the tree removal professionals know what exactly you need is a tree stump removal strategy. Tree trimming experts suggest you when to remove trees or just to trim the branches to prevent it from falling or to makes its appearance better. Tree removal service provider give you tips on various things on how to keep your trees in perfect order and enhance healthy growing. Following are some of the factors that demand attention during the tree trimming procedure. Like, in general, in early summers through spring season is not viable to work on your trees though it is not the case with all variety of trees sometimes it depend on vulnerability of diseases, etc.. For oaks it is not the time to trim during April to October, similarly, maples are best to trim in winter when they are dormant, to prevent “bleeding”. Before taking any tree trimming step on your own its better to consult an arborist who can give you a better idea and help to prune your tree in a cost feasible way. Tree removal is not an easy task. So, for beginners who want to trim it of their own, professional tree removal service providers will better suggest you in a proper you. For starters, it’s important not to cut a limb too short or leave it too long. Cut the tree close to the branches so as to prevent entry of insects and diseases. Also cutting down branches totally will seriously damage the natural structure of the tree affecting the natural growth of the tree and will also give an unbalanced and ugly look. ü Not to use a ladder while trimming trees instead, secure yourself to the tree from at least two points, using a harness and ropes. ü Checking the surrounding area for obstacles like a fence, another tree or overhead wires, etc. Check the tree itself for safety hazards such as dead or hanging branches. ü Not to carry a cutting tool with you while climbing later get the tools raised up when you have reached the place. ü Always wear a hardhat and safety glassesto protect yourself from falling branches, flying splinters, and other unexpected debris. ü It’s better to leave the major branches to the professionals.Large branches are very heavy and is unpredictable if cut incorrectly. It is very important to know all the tweaks when it comes to tree removal or tree trimming and it should not be taken lightly. How to climb, heights, cutting tools, which branch to cut and falling tree branches all combined together is a good deal of work. It’s better to contact a reputable tree trimming company or arborist in your area about taking care of the most important plants on your property. Large trees should be removed by a professional as guide ropes and mechanical equipment may be required for removing large limbs before felling. Tree removal is not a great deal of job but certain steps must be followed in order to achieve a safe and successful removal. Whenever the topic of diseases, insects or other maladies is brought up, we tend to jump right to some sort of control measure — a pesticide, a fertilizer, a spray additive — rather than taking a step back and thinking about not having it at all….or preventing it from occurring. There are at least five methods of problem prevention that relate to woody plants. The first is locating the tree in the best place in the landscape for success. Crabapples perform best in full sun, well-drained soils and surroundings with good air circulation. These conditions help prevent foliar and root diseases. As well, adequate space for branch development is important. 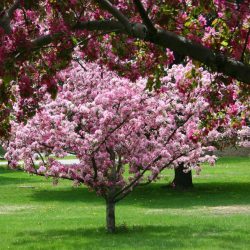 Generally, crabapples require less space than larger specimens such as tuliptree and sycamore, yet still need (on average) 500 square feet of unimpeded space in the root zone to develop well. Fruiting structures of cedar apple rust on a crabapple. Many crabapple cultivars are susceptible to pathogens such as apple scab, powdery mildew and fireblight. Others are moderately susceptible and others are resistant. It’s quite dramatic to observe two different cultivars growing next to one another, with one heavily infected and the other with healthy, normal leaves and branches. When choosing specific cultivars, it’s very helpful to check with local extension offices or land grant universities for information on cultivar resistance. Many maladies that develop in years 2, 3 and 4 of a tree’s life can be directly related back to the planting process. The depth and width is one of the common responsible factors involved. Best results are realized when the depth of the root mass is used for calculating how deeply to dig the hole, as well as the width. The simple but effective formula for this calculation is to dig the hole no deeper than the original root mass and two to three times as wide. An important caveat when planting is to find the top root of the mass and carefully remove any recently added soil that was placed over the top during production. This method of planting results in a “planting area” rather than a “planting hole,” with adequate room for redirecting girdling roots that have developed over time. Equally as important as proper planting procedures are the ones proved after the tree is in the ground. Good care after planting is essential, especially in the first 90 days following. The most important practices to pay attention to are checking and maintaining the mulch layer, watering and weed control. Follow-up visits to the site to ensure that 2 to 3 inches of wood chips are in place over the root mass and that chips are not piled against the trunk are very helpful in tree establishment. As well, probing the soil to determine the moisture content of the roots, and adding water as necessary to keep them moist, not soggy or dry, is an essential step. During these visits, taking a few minutes to pull the weeds and grasses that may have grown through the mulch is prudent to reduce competition for moisture and nutrients. A final preemptive practice is to take a good look at the limbs and remove crossing limbs or ones broken in the planting process. White PVC collar to reduce damage from sunscald and critters. Sunscald: Due to the normally thin bark of a crabapple tree, they are prone to sunscald. Most commonly occurring in winter, sunscald develops over time as the bark tissues are warmed by the winter sun during the daytime, then are harmed by the rapidly cooling temperatures in the evening and nighttime. When exposed to day after day of heating and cooling, its common to observe breaking, tearing and splitting of tender bark tissues, usually after the first or second winter. The south, west and southwest sides of the trunk are most often damaged due to the orientation of the sun’s rays. To prevent damage, white PVC columns are recommended to be installed in late fall and to be removed in early spring. Many apple orchardists simply paint the trunk white in an attempt to reduce damage, however, most property owners would prefer to avoid this type of discoloration. Critter damage: Crabapple trees, especially newly planted ones, are susceptible to damage from four-legged critters such as voles, moles and mice. These unwanted biters seek nutrients and moisture and unfortunately, often find what they’re looking for. The type of iHampton Roadsury that is caused creates desiccation from the trunk and future loss of movement of essential cell sap. The PVC columns described above are a good option for damage prevention, as are cylinders of hardware cloth and wire mesh. Placement of these devices should begin at the 4 inch below ground level for best results. Stem girdling roots on this crabapple will eventually reduce internal transport of water and nutrients. Girdling roots: Like many other tree species, crabapples are prone to damage from stem girdling roots. This iHampton Roadsury shows up in the form of roots that radiate from the original root mass in an encircling orientation rather than directly horizontally, like the spokes of a bicycle wheel. The consequence of this malady is that as the roots and trunk expand in size in the establishment process, they will impinge or push on each other, causing a restriction of movement of water and nutrients in the cambium and sapwood. Fortunately, girdling roots can be prevented by removing all plastic, burlap and wire, identifying roots that are beginning to encircle and gently teasing them out and reorienting them horizontally in the planting area. Mechanical iHampton Roadsury: String trimmers, lawn mowers, cars, skid loaders and fork lifts are the most frequent sources of mechanical iHampton Roadsury. The effects are similar to that of critter damage and sunscald, simply caused by two-legged human operators rather than the sun or four-legged animals. The most effective preemptive solution is to thoroughly train maintenance staff, especially 15-year-old juvenile delinquents, to be aware of the tender bark and the possible damage that they can inflict. Apple scab: Apple scab is favored by cool, moist spring weather, particularly when tree leaves remain wet for long periods of time. Initial symptoms appear as olive-brown round spots on lower leaf surfaces. As the disease progresses, the spots change to dark brown or black and take on a feathery appearance. In the latter stages, spots develop on the upper leaf surfaces as well. Once several spots develop on leaf surfaces, leaves begin to fall, causing the tree to become thin. Severe infections can render a tree 60- to 70-percent leafless by mid-summer. Not only is this unsightly, it deprives the tree of carbohydrate and sugar production, causing it to be weakened. In some situations, the infection will spread to crabapple fruits as well, causing them to be disfigured and/or fall from the tree. Control of apple scab begins with the selection of a disease-resistant cultivar. A consistent fungicide spray program can also be helpful in suppressing the effects of apple scab, particularly on susceptible cultivars, applied at seven- to 14-day intervals from prebloom through rainy periods of the growing season. Be sure to read and follow all label directions when using these products. Cedar apple rust: The conditions that lead to the development of cedar apple rust (CAR) are similar to those of apple scab. Initial symptoms of CAR are small yellow to orange slightly-raised spots on upper leaf surfaces. The number and size of the spots is somewhat dependent on the degree of resistance to the fungus; trees that possess a moderate to high degree of resistance usually express smaller and fewer spots. CAR is a unique malady to tree care in that it’s a “two host disease” After initial infection on crabapple leaves, the spots grow and develop into the inner tissues of the leaf, as well as beneath. On lower leaf surfaces, fungal fruiting bodies develop and during periods of cool wet weather, erupt and spread spores to nearby cedar and juniper trees and shrubs. As a result of this disease transmission, small, tan to brown corky growths occur, which are usually not noticeable by most customers. In the year following, however, a rapid change in size and shape occurs. Long bright orange gelatinous stands are produced from the growths, which contain spores of their own that are then spread back to the crabapple, starting the cycle over again. The fruiting bodies that occur on the cedar and junipers are quite striking and thought by most to be ugly; yet a small percentage of the populous actually consider them to be attractive. At any rate, CAR rarely causes damage to cedars. Control of CAR is similar to that of apple scab. Attempts to reduce infection by removing cedars and junipers from the landscape are usually not effective, as the spores that cause CAR can travel up to 5 miles in the wind. Thin foliage as a result of cedar apple rust and apple scab infection. Powdery mildew: Unlike apple scab and CAR, powdery mildew doesn’t require moisture on leaf surfaces to develop. Cool, cloudy days and stagnant air are the key conditions that trigger infection. Powdery mildew creates a whitish cast to tree leaves. Both upper and lower leaf surfaces can be affected. Usually, the leaves appear as they have been dusted with flour or ground limestone. As symptoms progress, defoliation becomes greater, causing the tree to become weak from malnourishment. In many situations, trees infected powdery mildew are also infected with apple scab or CAR, which causes more damage to occur. Powdery mildew is best controlled by proper siting and following appropriate pruning practices that allow adequate air flow through the tree canopy. Fungicides are a third step in the protocol. Fireblight: Fireblight has both leaf and stem tissue symptoms. Once infected, leaves turn a grey to blackish color, and turn limp. The stems, especially the terminal ends, take on the same color and usually exhibit a bend or droop, resembling a shepherd’s crook. These symptoms appear quite rapidly in spring, usually within a week or less. The disease is spread through spores that are released from stem cankers, oval-ish slightly sunken areas that look to be dead. Controlling fireblight is not easy, or any disease that is associated with a fungal canker. Other than streptomycin, limited numbers of registered fungicides are available, so one must rely on good cultural practices such as proper tree placement, separation of turf and ornamentals and avoidance of mechanical damage to the trunk and stems. Once infected, removing cankers through pruning is recommended to reduce the source of inoculum. The dormant seasons are best for canker removal. To reduce the risk of spreading the disease through pruning (from tree to tree or throughout the same tree), dip your shears in a mild bleach solution — one part bleach to nine parts water. The post Examining Potential Issues with Crabapple Trees appeared first on Tree Services. A harness, belt or saddle, depending on where the climber hangs their hard hat or helmet, is an intimate part of every working day, often spending a lot more time in contact with the user’s body than anything else in their life. Fall restraint: This system is meant to prevent the user from getting into a position where they can fall. It’s pretty limited in tree work and would most commonly be seen in the use of a body belt with the appropriate lanyard in an aerial lift or device. The right length lanyard used with a fall-restraint harness is the key component, as it is what prevents the user from getting to a spot where a fall could occur. Fall arrest: This system is supposed to stop a fall, as well as lessen the forces and possible iHampton Roadsuries. In tree care, these types of systems are most often called full-body harnesses and are often used in aerial lifts, though some can also be used for climbing. Work positioning: This gives the climber the ability to position themselves safely and correctly to carry out the needed work, preventing a fall while keeping the hands free. Side attachment points or D-rings are a good example of work positioning. Suspension: Its purpose is to sort of cradle the climber in an upright, slightly seated position while tied in above. When set up properly, it can also allow stable work positioning with both hands free. The post 4 Types of Climbing Harnesses appeared first on Tree Services.